The digital signage industry continues to see double-digit growth driven mostly by ad-based network systems. However, one should not overlook the accelerating double-digit growth of non-ad supported digital signage networks that are being deployed in manufacturing, commercial and higher education markets. With these deployments, purchase decisions are driven by integration with emergency notification systems. It must be understood that a digital signage network is not an emergency notification system; it is a powerful and dynamic supplement to an emergency notification system. When combining these elements, the operator must ensure the integration does not compromise any elements of the emergency notifications system’s ability to function at its highest level. This requires integration skills at the highest level, complemented with proactive strategic creation of content to react to the most likely emergency scenarios. Those charged with developing and implementing these systems need to understand that there are components required of both digital signage and emergency notification systems, as well as laws and codes that both systems must adhere to and support. Operators also need to understand how to evaluate and then choose from the available digital signage packages. In addition, they must ensure that the digital signage application software will integrate seamlessly with the emergency notification system. Recently, there has been a strong push from executive-level offices to increase the focus on safety in the workplace and on campuses. This trend began with an increase of safety and security staff. Now these departments are driving their organizations to embrace digital signage to support and enhance their emergency notification systems so they can react to emergencies ranging from severe weather to those created by human events. It is no longer considered acceptable to rely on blinking lights, horns and text/email programs to support an emergency situation. It is not only expected but also now required that companies and institutions provide the best systems to support their on-premise constituencies and stakeholders and ensure the safety of their teams. 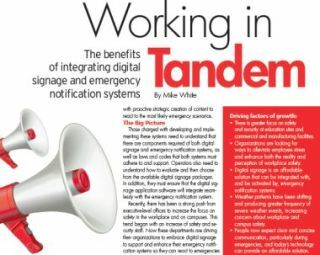 Integrating digital signage and emergency notification systems in a manner that can actually help saves lives requires an enterprise-level digital signage system that can ingest and integrate (even trigger) information from emergency notification systems. This allows the digital signage system to seamlessly become part of the emergency response without burdening the response team. With the use of digital signage networks, we can do more than let someone know there is an emergency. We can use pictures and videos to show people exactly what is going on and how to avoid danger. Remember, a dependable system that is not a burden on the network will continue to display the most recent valid content, even if the server connection is lost. There is greater focus on safety and security at education sites and commercial and manufacturing facilities. Organizations are looking for ways to alleviate employee stress and enhance both the reality and perception of workplace safety. Digital signage is an affordable solution that can be integrated with, and be activated by, Emergency Notification Systems. Weather patterns have been shifting and producing greater frequency of severe weather events, increasing concern about workplace and campus safety. People now expect clear and concise communication, particularly during emergencies, and today’s technology can provide an affordable solution. Mike White is president and CEO of Multi-Media Solutions Inc., a commercial audio/visual systems integration company based in Knoxville, Tenn.